"Where are we? I don't know." Director Alejandro Gonz�lez I��rritu's previous films Amores Perros and 21 Grams both take a set of disparate stories and link them with a single event, with complex and often arresting structures. 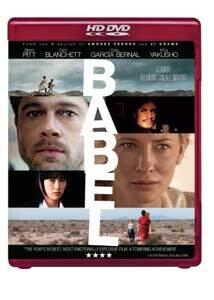 The third film in this informal trilogy, Babel, uses similar techniques to survey the difficulties of communication, arising both from disparate langauges and from other sources. The central story involves an American couple, Richard (Brad Pitt) and Susan Jones (Cate Blanchett), on a vacation to Morocco to try to patch up their marriage after the death of their infant. While on a bus, Susan is shot and Richard tries in vain to obtain medical help for her in the middle of nowhere. The second story covers the two young Moroccan goatherders whose father buys them a rifle to shoot jackals�while screwing around they manage to shoot Susan, creating an international incident. The Jones' governess, Amelia (Adriana Barranza), wants to go to her son's wedding across the border, and when she is unable to find someone to watch the children Debbie (Elle Fanning) and Mike (Nathan Gamble), she makes the huge mistake of taking them across the border with her. The fourth tale centers on a troubled deaf Japanese girl, Chieko (Rinko Kikuchi), who is tormented by her mother's death and confused about her frustrated sexuality. While the relationship of the first three stories is readily apparent, it takes some time for the context of the Japanese portion of the story to make itself known, and when it does, there's quite an impact. The aphorism that no good deed goes unpunished is certainly applicable here, as a kind gesture creates all the mayhem on two other continents. The chain of circumstance is inexorable, and the principals all mean well, though their actions do result in numerous disasters. There's a certain sense of fate riding over the proceedings, with any tiny change in behaviors sending matters on an entirely different path. Gonz�lez I��rritu provides a deliberate pacing that is nonetheless engrossing as he wraps the viewer into these disparate tales. The title references the difficulties in communication created by diverse languages, but that isn't the sole source of miscommunication. Richard is able to get some help from a friendly Moroccan who is able to translate for him, but the foregone determination by the U.S. government that the errant shot was a terrorist attack leads to problems with the Moroccan government, which as a result will not permit a helicopter in its airspace to retrieve Susan. Richard's frustration at dealing with bureaucrats becomes increasingly harsh, which only hurts his cause. By the same token, Amelia's limited English, the drunken macho demeanor of her nephew Santiago (Gael Garc�a Bernal) and the arrogant irritability of the American border guards leads to disaster. The refusal of the Moroccan authorities to listen to the goatherders, even though they speak a common language, is another and deeper failure to communicate. Perhaps the most poignant of all is the isolation of Chieko, which leads to her utterly inappropriate behaviors as she fumblingly attempts to realize her womanhood. Although Pitt has a reputation for appearing in fairly flimsy material, he does quite a lot with the lead here, first desperately trying to reconcile and then to save his wife's life. Blanchett doesn't get a lot to do, though she's always first rate. Barranza is highly moving as Amelia, loving the children, but being very human in her casual irresponsibility from time to time. She certainly merits the Best Supporting Actress nomination, an honor shared by Kikuchi, who inhabits Chieko in both natural and disturbing fashion. The structure is quite fractured in time and place, with some events set forth significantly out of order, but the narrative isn't difficult to follow, at least once matters get going. Part of this is due to the careful construction of very real and densely woven narratives that go straight to the heart. Anyone who has made a thoughtless decision that had unforeseen repercussions will recognize the painful journeys that result in this tale. Image Transfer Review: Much of the image is intentionally heavy on grain, giving a gritty appearance to the film. While this doesn't translate well on standard DVD, which has a rather sparkly appearance, it looks much more natural and filmlike on the HD DVD. There are still a few segments that are too much for the AVC codec to handle�there's a slight sparkle apparent at those times�but that's really the only significant detraction in the transfer (the end titles also have a bit of judder that's noticeable). The visuals are intentionally washed out (other than the neon Japanese nights, which are overwhelming in their color). While the photography is a bit soft, the HD version really shines in its detailed long shots of the Moroccan desert. Crisp even in fine details, they're like looking through a window. Audio Transfer Review: English and French DD+ 5.1 tracks are included, though most of the dialogue is in neither of those languages. As is appropriate, they're quite clean and noise-free. What is really stunning on these tracks is the music score composed and performed by Gustavo Santaolalla, which has a marvelous immediacy that makes it seem like he's playing right in your living room with you. This is as detailed a soundtrack as I've ever heard. Extras Review: The sole extra is a trailer, though it is happily presented in HD. Chaptering is a shade thin for a movie of this length. A fascinating tale of the consequences of failure to communicate that tears at the heartstrings. The HD version makes the difficult source material look filmlike.